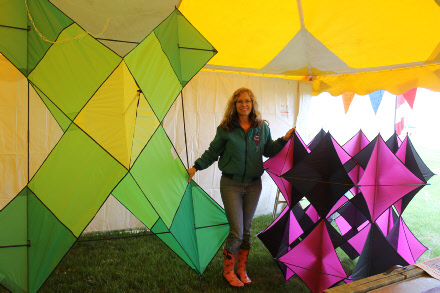 The first North Dakota kite festival started in 1992 as Skydance Sakakawea, by Deb Lenzen, a counselor at North Shore and Garrison Schools. The festival was started with only a few flyers and has since grown into a statewide attended event. After 20 years, Deb decided to retire and pass the reins on to what is now Skyfest. 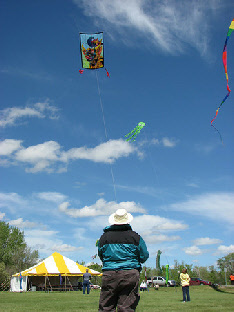 Today, she continues to design, sew and fly her beautiful art kites in Arizona. Her travels take her across the country, always with a few kites along to be flown. The continuation of this family friendly tradition did not come without the hard work and dedication of many. With help from acquaintances at the State Tax Department, and the Garrison Area Improvement Association, Rena Rustad was determined to put a team into place that would work to continue the festival. Jude Iverson of GAIA, worked tirelessly writing a grant that would ultimately get the new festival up and running. Along with the hard work of folks at the GAIA , Ft. Stevenson State Park, many dedicated fliers and kite enthusiasts, a board of directors was formed. Today, thanks to the hard work and dedication of the past coordinator, this event has blossomed into an annual family friendly festival.